file at the bottom of each article. increasing your search engine presence. engine spiders readily spider the text on your web pages. Effective Article Writing - Do the Research First! to both the search engines and your potential readers. methods is to write and distribute articles. stand a good chance of getting top search engine rankings. be read. Find out why RSS is a great alternative. be constantly indexed and updated by Google. create a Google Site Map for your web site. therefore appeal to a larger number of visitors. main browsers and does not rank well for the major search engines? and start making sales immediately. of web site visitors that read your ad? rankings, attract more visitors and make more sales. 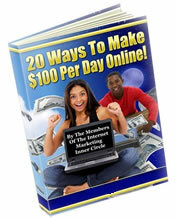 web site will become very profitable. which you can use for future design projects. beautiful graphics that strive to capture my attention. I was in the same boat as you. It is not as difficult as you think. ultimate purpose of your site if you are trying to sell something. making good money within days. and 5 Ways You Can Prevent It. site, then convert them to paying customers. you really make good money from this source of revenue? some of it will stick. They have not yet found their niche market. Until recently text-based email was the most popular way to communicate, however with the advent of html email you can now create and send beautiful graphics, create clickable links and use interactive forms. An HTML email form is often used in email marketing to generate a greater response from potential customers. However their is not much information on how to actually create an interactive html email form or template to achieve this. Do you often get bogged down with too much email to handle, chewing up your valuable time online? With email being one of the most popular forms of online marketing you can be sure you are going to receive much more email in the future, wanted and unwanted. to concentrate more effectively on your business. you need to find a large number of high quality links from other web sites. effective web site promotion strategies you could use. your own article as well as provide valuable resources where to publish your articles for maximum exposure. Your business plan is like a road map to long-term success. don't plan out your business strategies. If you are serious about improving search engine rankings, you need to check the keyword density of your web site. In order to do this you must integrate proper keyword phrases within your meta tags and web copy. When a prospect shows an interest in your product, if you don't deliver what he wants immediately and follow up on him, you lose sales. site and put in on the Net. site. Since 85% of your sites traffic comes from the search engines, it is well worth the investment. Search engines are still one of the most effective ways to drive traffic to your web site. Make your site as attractive as possible to the search engines, so your rankings will improve. Statistics show that only one of every four Web Sites Meta tags. However using these tags can give your site an advantage over other sites that do not. You may be 1 of 4 web site owners that has not optimized your site with keywords for ranking in the search engines. You say you have inserted keywords in your site, but are they targeted keywords? Placing keywords strategically throughout your web pages will greatly improve your rankings in the search engines. Many sites, however, leave them out altogether so your Site won't get ranked at all. Choose a business in which you will have sustained interest, so you can whether any little bumps in the road. Then build a theme-based web site. Opt-in email safelists are one of the best Internet marketing strategies for getting your product or service immediately in front of many thousands of people. In this article, I will show you how you can successfully work with them. Have you spent a lot of money on advertising with the expectation that you would get many sales from the 1000s of people that visited your site or read your ad? Here are some of the most effective ways to promote your online business without spending a fortune and gaining great results. Have you been following up on your contacts by hand and found it very time consuming? Do you want to increase your chances to make more sales, keep more of your customers? An autoresponder should be part of your marketing arsenal. Have you been unable to focus on marketing your business, since the terrorist attacks? Have sales been down for the past few weeks. What can you do? Well, you can't just sit on your behind and just hope that things will magically change and money will come rolling in. targeted customers locally. Why should you bother? Discussion on the free submission and paid submission methods for each search engine directory. Getting listed in the search engine directories is more difficult than the major search engines. Preparation and patience is needed. Getting your web site listed in the major search engines is an absolute necessity. Why? Because 85% of all people on the Internet use them when searching for information. When they type the keyword or keyword phrase in a major search engine, up pops your web site, or at least you hope so. pages to the new pages without losing your rankings? You can do this by using a " 301 redirect "
out on attracting lots of free traffic. convert them to paying customers. Normally I don't like moving objects when I arrive at a web site. It distracts visitors from getting to the content. However, many web sites could enhance their visitor's experience by creating rotating images on their home page by using an image rotation script. Frame web sites are generally frowned upon by most web site designers because they not supported by all browsers, take longer to load and are not search engine friendly. Why then would you want to create a frame web site or frame page? If you have been struggling to set up forms on your web site using cgi, then definitely read this article. Installing a simple PHP form is much easier and faster than installing a cgi form and doesn't need any programming experience. Writing for your web site is not the same as offline writing. The fonts used for print media are different than web fonts. This is because it's harder to read text on a computer screen and visitors tend to scan your web pages rather than read them word for word. Have you ever tried to design your web site with a beautifully selected font, only to realize that most folks don't have it installed on their computer? Manually changing each page on your web site would take hundreds of hours. So, what’s the answer? Use Server Side Includes to update your entire web site. When surfing the Web these days, you often come across web sites that suffer from stagnation – they look old, obsolete or appear to have been designed by an amateur. If you are a small business person who wants to reach millions quickly and easily, building a web site is a necessity. There are many ways to build a website but I'll just give you an overview of the most popular ones. Are people visiting your web site but not buying? This may be a sign and the time to do some redesign of your web site. Often you are so close to what you have created, that you can’t see obvious design mistakes. experience. Properly preparing your images is necessary to enhance the appearance of your web site. Image optimization is the art of making your images suitable for the Web. There is a large difference in preparing your graphics for print compared to the Web. Studies show that a one-second improvement reduces click-aways up to 65%. Faster page views means more page views and a better user experience. This leads to higher user retention and therefore more revenue. It seems that everyone from the 15-year-old kid to their Grandmother is able to design a web site these days. Creating a web site is not as simple as typing a letter. If you want your site to look professional, it is imperative to find a designer that will be with you from the start to the finish of your web site. Have you ever set off in the car to your destination, without a map, naively believing you will find it? Several frustrating hours later, you are either lost or stressed out. Your wife says, “I told you so – you should have brought the map!” This is the same situation when you create a web site without planning. If your web site visitor can’t find the information on your web site, within 10 seconds or less, you will lose them. Have you ever experienced the frustration of waiting for a web site to download, then giving up and moving on to another? This is because most web users lose their attention after 10 seconds. Searching for the right information on a web page can be a very frustrating experience. Have you ever encountered web pages that are so cluttered with information and graphics, that you leave, totally exasperated? A fast and simple navigation structure is essential for a successful web site. Visitors must have a good experience at your site, if you want them to return. Checking your web site’s usability can generate more traffic to your site. It may take you a little extra time and patience, but you can be assured you are reaching and pleasing a wider audience. increase your web site's interactivity it's a necessity to know how to do it. You need to choose your domain name wisely, if you want to clearly identify and brand your online business for many years to come. Ok, you have your web site built and are now confused as to all the choices you have in order to find a home for your site. It is good to make a right choice the first time. Many web hosts try to sell you a large amount of web hosting space that then costs you a lot each month. However, you may not need this much space. Have you ever calculated just how much disc space (MB) your web site uses? Do you really need an expensive hosting solution for your web site? Using too much bandwidth on your hosting plan will result in paying higher fees. Learn how to cut your bandwidth usage and save money. You want to change web hosts because you have found a less expensive solution for your web site. You are not happy with the services your host is providing. Web traffic analysis allows you to determine what marketing strategies are successful, then to change them accordingly, to boost your web traffic and sales.